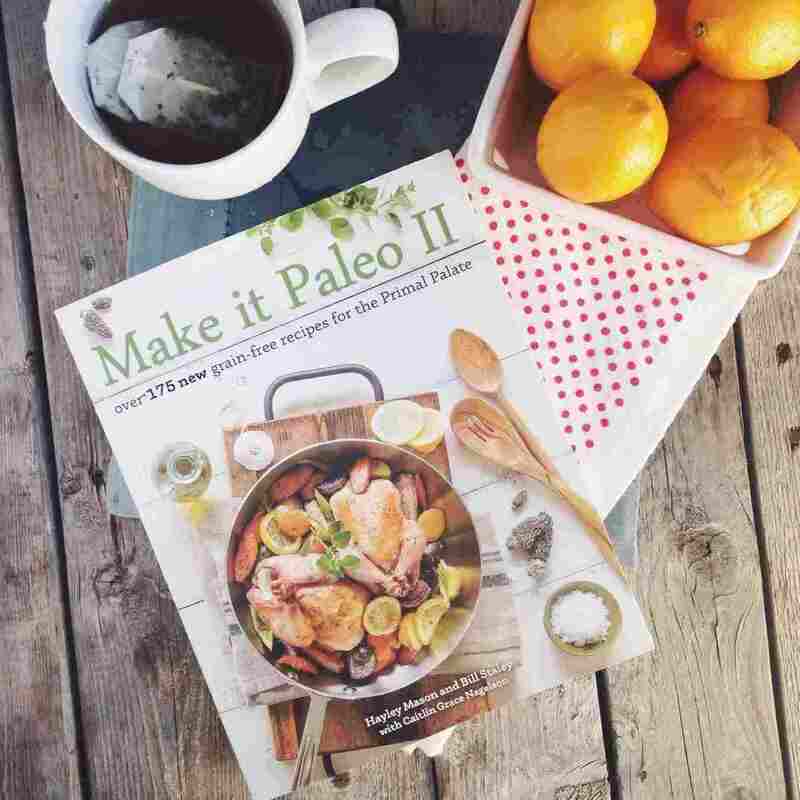 I am so honored to be writing a review of Bill Staley, Haley Mason and Caitlin Nagelson’s new book Make it Paleo 2. After first learning of the paleo lifestyle a few years back, my initial encounter with the diet, long before my blogging days, was Bill and Haley’s first book Make it Paleo. It was our go-to in learning the new lifestyle, experimenting with new flavors and helping to enhance my overall cooking skills. Now as I look back on that and see how things have been orchestrated in the fashion it has from submitting recipes to their site, Primal Palate and being extremely blessed to be a part of The Best of Paleo 2014 e-cookbook, I feel extremely honored to be writing this review for them. I have only spoken to them briefly to prepare for this interview but seriously you guys, they are one of the most kind-hearted couples. 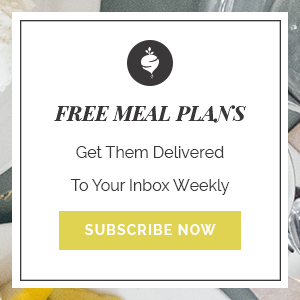 They are definitely charging a path to help people create a healthier life, that is easy and realistic through the creation of some pretty amazing recipes. Their newest book has everything you dream of, but never thought possible. 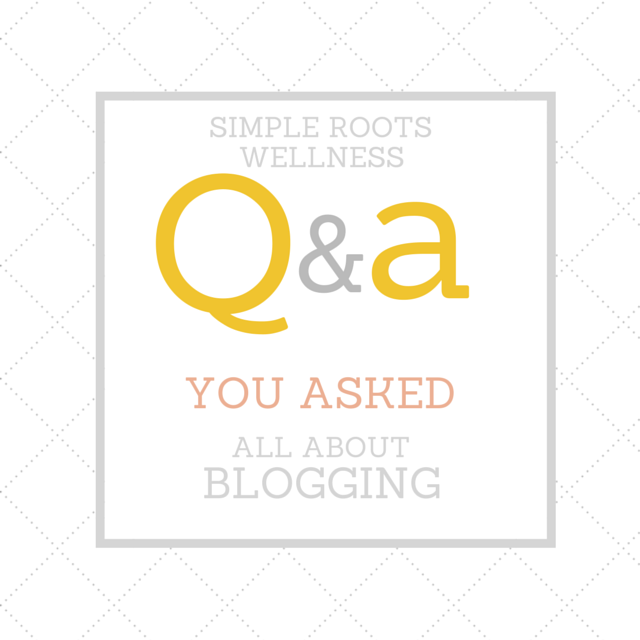 Can you say, paleo pasta? Pasta you guys, I can’t even! Like fettuccine, ravioli, and lasagna noodles. My heart has skipped a few beats reading through each and every page of this beautiful cookbook. Allergen friendly, a heaping dose of AIP recipes, it is clear that this book is suitable for everyone. We have tried quite a few of the recipes in the cookbook including the luscious lemon cupcakes. The were delicious, but that is a given when you take a cupcake and fill it with lemon curd. There is no arguing there. 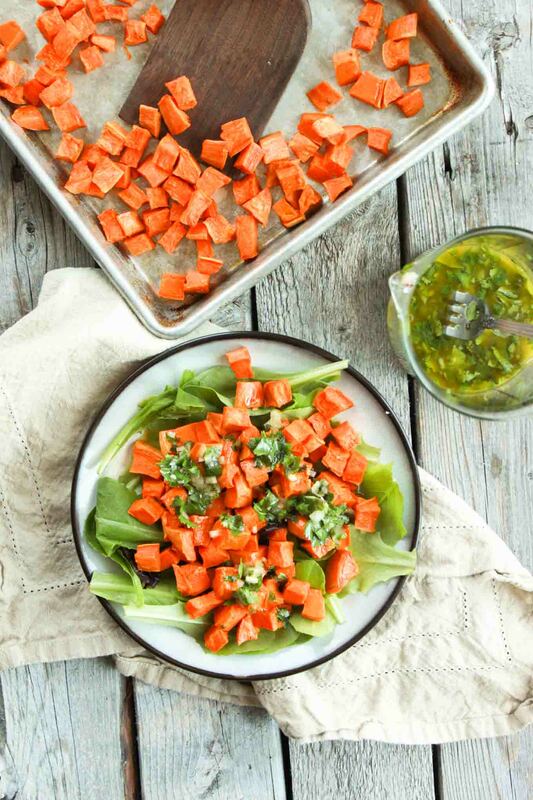 The latest creation from the cookbook was these roasted sweet potatoes with citrus dressing. I’m slightly obsessed with roasted sweet potatoes. In fact, I’m sure I will never get over them and I rarely sway from my standard seasoning of salt, pepper and cinnamon. So I thought it was time I step outside my ‘comfort zone’ of the same ol’ sweet potatoes and mix it up with this recipe. It didn’t let me down! And just when you thought it couldn’t get better, it does. One of you lucky little foodies is going to be getting a free copy of this creative, beautiful cookbook. Complete the giveaway which ends on Friday to be one step closer to filling your belly with pasta, quiche, pizza, cupcakes and gelato. Your stomach will thank you, trust me. While you wait, make this recipe today and go buy their cookbook! Peel and chop the sweet potatoes into bite sized pieces. 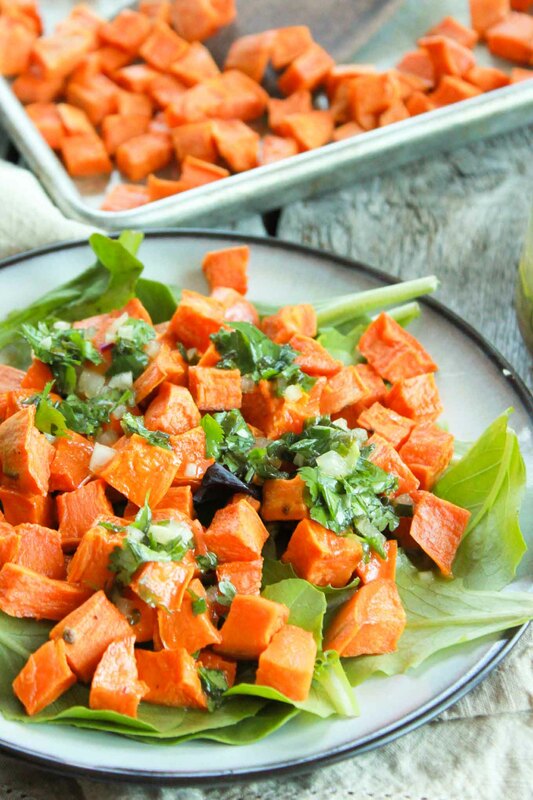 Spread the sweet potato pieces evenly over a large rimmed backing sheet lightly greased with coconut oil. Toss with the melted coconut oil and season with salt. Roast for 40 minutes or until fork tender, stirring every 15 minutes to ensure that they cook evenly. While the sweet potatoes are roasting, make the dressing; combine the lemon juice, olive oil, water, salt and pepper in a small mixing bowl, whisking to blend the oil with the acid. Add the coconut sugar and whisk again until it has dissolved into the dressing. Add the cilantro, chives and shallot and whisk again to combine all of the ingredients. Remove the sweet potatoes from the oven and carefully transfer them to a large glass mixing bowl. Pour the dressing over the potatoes and carefully mix to coat the potatoes evenly in the dressing. Sprinkle with lemon zest over the top of the potatoes and stir again.